Photo of: East Coast of Ireland: Meath: Trim. 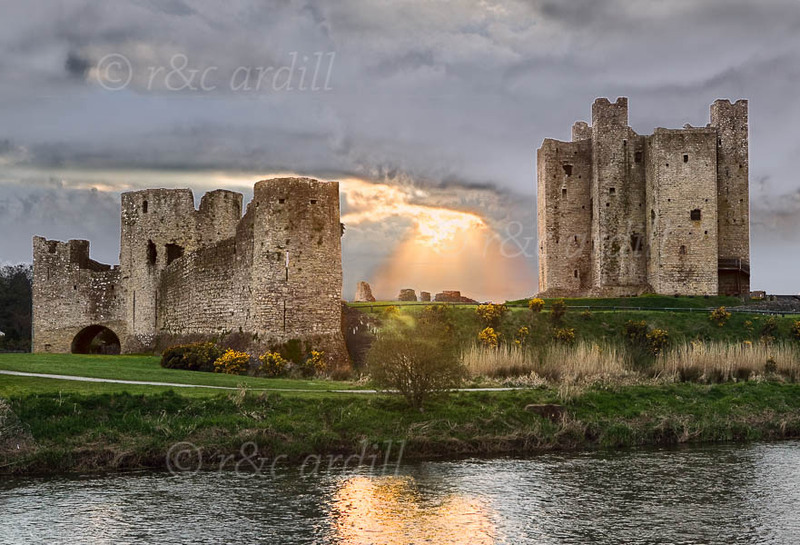 A view of the river Boyne and Trim Castle at sunset. Trim Castle is the largest Anglo-Norman castle in Ireland. It was constructed over a thirty-year period by Hugh de Lacy. Hugh de Lacy was granted the Liberty of Meath by King Henry II in 1172 in an attempt to curb the expansionist policies of Richard de Clare, (Strongbow). Construction of the massive three storied Keep, the central stronghold of the castle, was begun c. 1176 on the site of an earlier wooden fortress. This massive twenty-sided tower, which is cruciform in shape, was protected by a ditch, curtain wall and moat.